These fun catchy songs help students learn the conjugation of verbs in the present tense (regular, reflexive, stem-changing, and -cer ending verbs), the present progressive, & the preterit. A must for the beginning to intermediate Spanish learner! 11. Antonia, ¿Qué Has Hecho? Spanish songs are such an important part of our Sing ‘n Speak Spanish program. Spanish is especially beautiful in song, and when students sing the catchy songs over and over again, the repetition they need for long term retention of vocabulary and correct pronunciation takes place easily – like magic. Our program integrates thematic songs into the entire five year curriculum. "My daughter has taken Sing n Speak Spanish since Kindergarten and is now in 4th grade. Her biggest joy of this program is the music, much which is sung by Julia, the creator of the program. The songs are SO FUN – we listen to them in the car while driving many more times than required because we love them so much. My daughter has downloaded them all to her phone, so listens to them as some of her very favorite music. She knows every lyric and every melody precisely. There are so many good things to say about this Spanish program, but the music is by far our favorite. It has helped my daughter learn Spanish in such a fun and creative way. We have every one of the CD’s and just wish that Julia would keep putting out many more CD’s in the future. Her voice is so rich and beautiful, and she is so talented. Thank you for such a wonderful program!!" 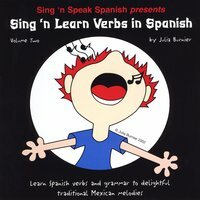 The Sing ‘n Speak Spanish® program works most effectively when each student has a Music CD and its companion Songbook with lyrics in Spanish and English.